A body and face wash developed for men's skin with Micromoisture technology. Micromoisture activates on skin when lathering up, clinically proven to fight skin dryness. Extra fresh cleansing gel that rinses off easily. With a cooling agent. Dermatologist recommended. Did you know by reducing your shower 2 minutes you can save an average of 40 gallons of water a week? 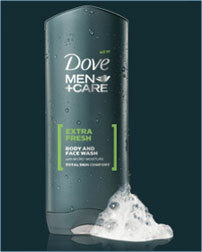 The Dove® Men+Care Extra Fresh Body Wash with MICROMOISTURE technology is clinically proven to fight skin dryness better than regular men's body wash. This ultra-light formula rinses off easily for a refreshing clean and total skin comfort. 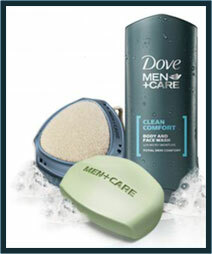 For best results, use this body wash with the Dove® Men+Care Active Clean Shower Tool. Refreshing cleansing gel rinses off easily. MICROMOSTURE activates on skin when lathering up. Droplets are precisely sized to deliver optimum moisture without feeling heavy. Specially formulated with proprietary technology and designed especially for men, the Dove® Men+Care Extra Fresh Body Wash both cleans and protects skin. It provides the refreshment men want, and like all products in the Dove® Men+Care line, is clinically proven to fight skin dryness without irritation or tightness. Recommended by dermatologists, Extra Fresh Body Wash provides total skin comfort. It's the only men's body wash with ultra-light MICROMOISTURE technology, a unique gel that activates directly on skin during lather to guard against skin discomfort. With its rich lather and moisturizers, Extra Fresh Body Wash pampers skin as it cleanses. It also rinses off easily and completely, leaving only clean, refreshed skin behind. And it's effective and gentle enough to use every day. The Dove® Men+Care products are specially formulated to provide total skin comfort and a refreshing clean, without irritation or tightness. This innovative product collection includes Body and Face Wash with MICROMOISTURE technology, Body and Face Bar, and a Shower Tool. 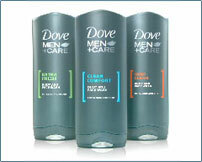 One pack containing three 18-ounce bottles of Dove® Men+Care Extra Fresh Body Wash. When one of our chickens die, we normally just toss the body out into the field, and within a day the local scavengers have taken care of it, leaving only a few feathers. Usually it is the ravens or sometimes turkey vultures. Today however, we had a big bald eagle on the clean up crew.